Winton is known in history as the birthplace of Qantas airline in 1920 and where Banjo Paterson wrote the famous Waltzing Matilda in 1895… .. Winton in the present day is known for its proximity to the Queensland Boulder Opal Fields. This recognition can be attributed in the most part to my late father’s pioneering spirit, passion and fascination with the opal which guided his life and that of his extended family. Vince’s interest in opal began in Primary school when he read in a geography book that Winton was famous for its opal, yet he had never seen or heard of them. these words were never forgotten. During the 2nd World War there were American service men in the district who showed a strong interest in the gem. Vince’s father often sold them opal from Lightning Ridge he had purchased from shearers who travelled back and forth between the two towns. Vince’s father and his friend tried to export Lightning Ridge Black Opal material to the USA towards the end of the war but failed. Vince took over the family theatre business in the late 1950’s. Vince’s first venture into opal was in the early 1960’s. Vince borrowed 1000 Pounds to buy a parcel of opal some hobbyist had found near Winton, good quality pipe opal. Vince took it to Sydney and lost heavily. 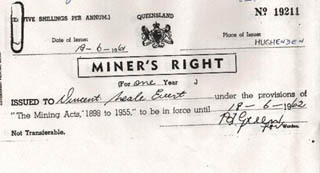 Undaunted, he purchased an old backhoe, and employing one man he started his own mining venture, he pegged his first lease in 1962. It proved disastrous, Vince struggled to cover the running costs each month and for years subsidised the mining with his other business to the point where it almost broke him. But it was his passion. Vince later searched out fellow pioneer Des Burton who was having some success in the Quilpie area. Through Des, Vince learnt, how to mine more effectively using heavy equipment, and in order to succeed you need to do your own cutting and marketing both overseas and within Australia . Television come to the west in the early 1970’s…. The movie business was finished so Vince turned his full attention to the opal business.. it wasn’t easy. Vince established his own opal cutting workshops , ventured to American and learnt how hard it was to sell a relatively unknown gemstone on the world market. He brought more machinery, employed more cutters and made more trips to the USA and Europe and strengthened his resources until he finally broke into the markets of Japan, Europe, USA and Asia. Vince subsequently won 2 export awards from the Australian government and was given government assistance to exhibit at several international gem shows. As a leader in the industry, he founded the Queensland Boulder Opal Association. In 1986 Vince had the opportunity to purchase a jewellery store in Townsville (coastal city 7hours drive from the opal mines). This was the beginning of a new chapter. Vince realised the best way to market his product was to control the entire process from the mining, cutting then designing for the manufacturing jewellers and then to retailing this unique gemstone. His vision was to show the world the true potential of one of the world rarest and most beautiful gemstone by controlling the quality of the production …. Mary Evert - Director of Evert Opals Pty Ltd since 1990 - current comments.